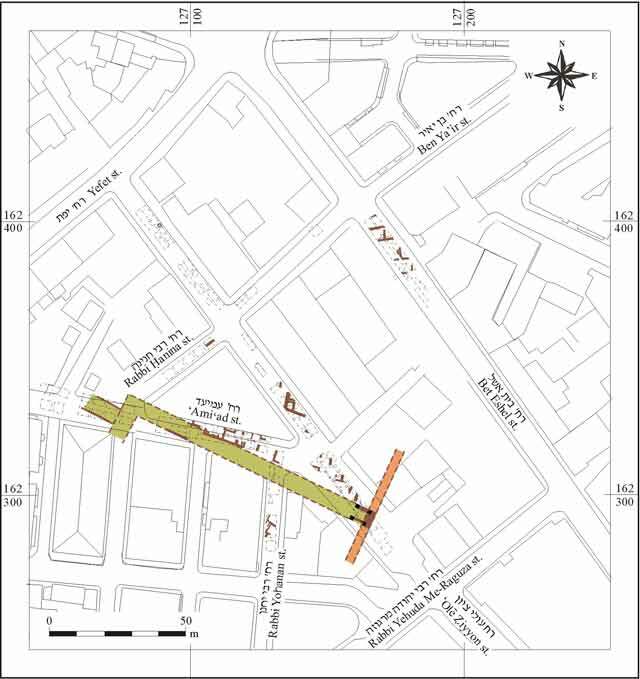 From October 2002 to December 2004 several salvage excavations were conducted in the area of the flea market in Yafo (Jaffa), southeast of the tell, which had only been sporadically investigated in the past (Permit Nos. A-3740, A-3751, A-3876, A-4034; map ref. NIG 170070–124/662308–386; OIG 127070–124/162308–386; HA-ESI 110:46*–47*), in the wake of the complete replacement of underground infrastructure. This project gave a unique opportunity to investigate the archaeological remains of this part of Yafo. The excavations, on behalf of the Antiquities Authority and funded by the Tel Aviv municipality (Ha-Mishlama le-Yafo) and the Ministry of Tourism, were directed by M. Peilstöcker, A. Re’em and P. Gendelman, with the assistance of E. Haddad, L. Rauchberger, A. Dagot, R. Haim, D. Golan (area supervision), S. Ya‘aqov-Jam, Y. Dangor and E. Bahar (administration), V. Essman, V. Pirsky and T. Kornfeld (surveying and drafting), T. Sagiv (photography), Y. Nagar (physical anthropology), A. Peretz (conservation), M. Avissar and E.J. Stern (pottery consultation), R. Kool (numismatics), T. Shacham (Jaffa Museum of Antiquities), E. Ayash and M. Ajami (Tel Aviv district archaeologists). The excavations were carried out in seven streets: ‘Ami‘ad, Rabbi Yohanan, Rabbi Hanina, ‘Olē Ziyyon, Ben Ya’ir, Rabbi Yehuda Me-Raguza and Bet Eshel (Fig. 1). Early Islamic, Crusader and Ottoman periods. Tombs from the Mamluk period and finds from the time of the British Mandate were recorded as well. A preliminary stratigraphical sequence (Table 1) is given, as well as a comparison between the current excavated areas and other projects carried out in Yaffo (the Clock Square area, the Ganor compound and the Armenian Monastery; Table 2). The following report summarizes the most important finds in the excavated areas, as they appear in Table 2. ‘Ami‘ad Street. Remains of a street, running roughly parallel to the modern street, were uncovered (Fig. 2). The street underwent repairs at several stages and street layers accumulated up to half a meter and more at some places. Flanking the street on both sides were a number of installations and remains of buildings, which were only partially unearthed and therefore, little can be said about their function. The pottery found below the floors of these buildings indicated that the street had existed at the end of the Byzantine period and did not change its course until the end of the Crusader period. Remains of a winepress were discovered close to the corner of ‘Ami‘ad and Rabbi Yohanan Streets. The winepress was built in an advanced phase of the Byzantine period and parts of it still functioned during the Early Islamic period. At some point during the latter, the installation went out of use and served as a storage facility until the end of the Crusader period. The gap after the destruction of the Crusader city ended in the Ottoman period, when the area was exploited for agriculture, as evidenced by a number of irrigation channels. Rabbi Yohanan Street. This street was investigated from its junction with ‘Amiad Street until Rabbi Pinhas Street. 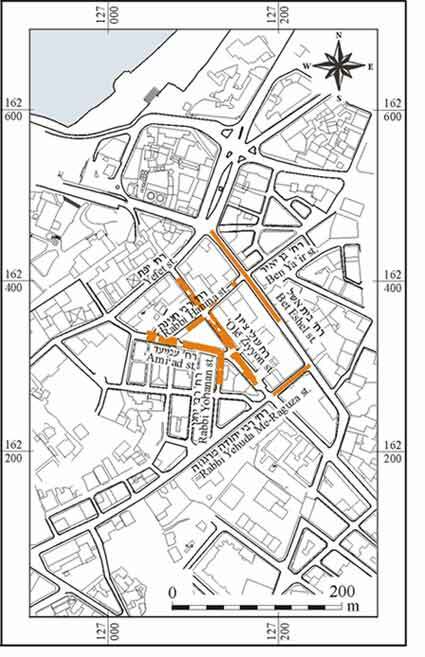 The junction had been used as such for the ancient street as well, although the latter is mostly overbuilt with the modern structures of Rabbi Yohanan Street. A number of structures on both sides of the ancient street could be excavated, all following the same north–south orientation. Installations, such as ovens, indicate a domestic use of these buildings, although none was completely exposed. The finds showed a continuation from the end of the Byzantine period until the end of the Crusader period, with minor changes in the architectural layout. Rabbi Hanina Street. The excavation in this street was limited to a depth of c. 1.5 m. Two finds are worthy of mentioning. The first is a well, dating to the Ottoman period, which most probably provided water for the irrigation channels in the nearby ‘Ami‘ad Street. The well was equipped with an engine that served as a water lifting device in its latest phase of use. The second find consists of the building remains from the Crusader period. Although the function of the structure remains unclear, its importance lies in its orientation, following the general north–south direction of other structures from this period. Olē Ziyyon Street. Three areas were opened: Area I (between Yefet and Rabbi Hanina Streets), Area II (between Rabbi Hanina and Rabbi Yohanan Streets) and Area III (between Rabbi Yohanan and Rabbi Yehuda Me-Raguza Streets). The most impressive element in Area I––cannon––was discovered when the sidewalk was dismantled with the aid of a backhoe. Although not in situ, it can be explained in two ways: it either served to defend the city wall, which roughly followed the line of modern Yefet Street or it was used in an attack on the city. The date of this canon connects it to the Napoleonic campaign against Yaffo. Further remains of the Ottoman-period irrigation systems were unearthed in all three areas. In addition, remains of a building that was probably a farmhouse or a storage facility and dated to the same period, was found in Area II. A well was found in Area III, containing a fill with a large number of human bones and cannon balls that evidenced one of the battles for the city in the eighteenth or nineteenth centuries CE. Architectural remains from the Crusader and Early Islamic periods in Area III included a massive structure, dating to the twelfth century CE and suggesting an administrative or public function. Close by, skeletons of donkeys or horses together with a number of arrowheads, one of them between the ribs of one of the animals were excavated. The remains of a massive wall (width c. 4 m) were unearthed in Area III. Although only the core of the wall was preserved, it width implies a defensive function. At the eastern side of the wall was an opening, flanked by four pillars, which probably served as a small gate or postern (Fig. 2). A sand-filled trench to the east of the wall may have been a ditch around it. Pottery and coins dated this system to the Crusader period. Two winepresses are particularly interesting. One was found close to the junction with ‘Ami‘ad Street, in the vicinity of the winepress in this street. The second, discovered in Area III, was an unusually large installation that consisted of at least seven separate winepresses. The concentration of these installations shows that industrial production of wine was carried out in this area during the Byzantine period, as well as during parts of the Early Islamic period. Ben Ya’ir Street. A limited area was investigated in this street, revealing finds dating mostly to the Crusader and Ottoman periods. Remains of a structure with an opus sectile floor, which dated to the Byzantine period and was recorded in an earlier excavation (Permit No. A-3291), were excavated. Rabbi Yehuda Me-Raguza Street. The continuation of the sand-filled ditch was found in this street. The large amount of sand prevented its excavation from being completed down to bottom. The remains of a late Ottoman building were excavated close to the junction of Rabbi Yehuda Me-Raguza and Bet Eshel Streets. Bet Eshel Street. The excavations on this street were divided into four areas. Areas A and B (Yefet–Ben Ya’ir Streets), Area C (Ben Ya’ir–Shim‘on Ha-Zadiq Streets) and Area D (Shim‘on Ha-Zadiq–Rabbi Yehuda Me-Raguza Street). A number of trial trenches dug with the aid of a backhoe in Area D indicated that the area was covered with a thick layer of clean sand, similar to the situation observed in Olē Ziyyon Street, Stratum III. It seems possible that this depression, which was filled up with sands blown in from the Mediterranean Sea, was connected to the outer Crusader fortification line, whose elements were found in Olē Ziyyon Street. The remains of a large structure were unearthed in the western part of Area D and in Area C. The building, which comprised a number of parallel walls roughly oriented north–south, was dated to the Crusader period on the basis of pottery finds. Parts of the same structure had previously been excavated (Permit No. A-2374-1) and seemed to belong to a large storage facility. The building was bordered on the west by another street that was partly excavated in Area B. The Crusader ruins covered remains dating to the Early Islamic period, including parts of buildings constructed in the terre-pisée technique. The walls of these buildings were built of earth, mixed with other components, which had been filled into supporting constructions of wooden planks, similar to those used nowadays for concrete. Once the fill had dried out the wood was removed. Potsherds within the earthen fill dated to the Early Islamic period and indicated that the structures were built during this period or later. The same construction technique was observed in the excavations at Yaffo Ganor (ESI 20:47*–49*). Tombs dug into the Crusader-period street levels of Area B lacked any datable finds. However, they were covered with early Ottoman structures and thus, should be dated to the Mamluk period. Additional remains of the Ottoman period, including parts of a building, plastered irrigation channels and a plastered pool were discovered in Area A. As in Area B, these remains covered a layer that contained burials, all following the same east–west orientation––the head of the interred on the west and looking south. Below these burials were the remains of several Crusader and Early Islamic structures and installations that followed the same north–south orientation observed in the other areas of Bet Eshel Street. Further analysis of the small finds will provide a more accurate dating of the remains, but at least one installation served as a furnace for smelting metals in the Early Islamic period, indicated by the large amount of slag discovered in the area. Intermittent trial excavations reached levels dating to the Byzantine and Hellenistic periods. The architectural remains excavated at Bet Eshel Street rule out the possibility that this street was the main route to Jerusalem in former times. The preliminary excavation results of this ongoing project add important information on the history and archaeology of this, nearly unknown section of Yaffo. This area was densely populated as early as the Hellenistic Period, creating a sort of ‘Lower City’ at the eastern fringes of Yaffo. Following the gap in the Roman period, the area served for the industrial production of wine during the Byzantine period, which was, most likely, connected to the seaport of Yaffo. The general orientation of the excavated remains evinced a planned layout of the street system and the recovery of roof tiles and marble elements signified the existence of public buildings in this area. During the Early Islamic Period the function of this area remained practically the same, although the wine industry came slowly to an end, as known at other sites. This could be partly related to the absence of international markets (export), at least during the later part of this period. The Crusader period witnessed a densely populated area once again. Although the general orientation of the buildings remained the same, the quarter seems to have had now a more domestic character, possibly for the Crusader forces stationed outside the fortress of Yaffo. The lower city of Yaffo was probably fortified, as evidenced by the remains in ‘Olē Ziyyon Street and the thick layer of burnt material discerned in all excavated areas and pointing to a violent end of this period. Following the Crusader Period, the area remained deserted and was used as a burial ground in the Mamluk period. The numerous irrigation channels from the Ottoman Period should be connected to the agricultural exploitation of the area, which came to an end in the late Ottoman and Mandatory Periods, when this area of Yaffo gained its present-day layout. 1. General map of excavated areas. 2. A proposed reconstruction of the Crusader outer wall, gate and street.